Could this be a "Stone Age" fishing net weight or arrow shaft straightener? 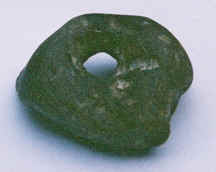 A stone with a hole drilled through the middle with one side unworked and the other side shiny, looking as though there might have been a little bit of flint chipping. climate changes, deposition, and erosion events. was not enthused by Gunnar's stone tool count. Is this another fishing weight?